More Southdale Center goodness--this time in technicolor! This photograph isn't specifically dated so I'm not real sure of the year here, but I think it's sometime around the '60s. PS: I have family in town visiting right now, so I'm not on the computer much lately--as you could probably tell. Posting frequency (and volume) on MOA will return to normal levels again very soon! 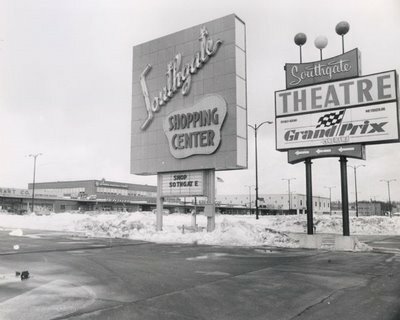 I just love this vintage snapshot of the Southgate Shopping Center (aka Southgate Mall), Milwaukee’s first shopping center, along with its very groovy entrance and movie theater signs. "After two years of work, Southgate was ready for those customers. The $5 million center was an open air marketplace, not a mall; its 20 stores shared a single roof and a canopied sidewalk. The complex covered 105,000 square feet of retail space, and the rest of the 30 acre site provided parking for 2,000 cars. Milwaukeeans found Southgate irresistible. The center opened on Sept.20, 1951 a weekday and the developers were pleasantly surprised when more than 60,000 people showed up for their 'family party!' The entertainment was vintage Milwaukee: Polish and Italian folk dancers, polka bands on the blacktop. A visit from Alice in Dairyland a world champion flagpole stander and, of course, fireworks. ...The addition of a Gimbels department store in 1954 gave Southgate a genuine anchor. Krambo grocery store, Milwaukee's largest, opened on the south end in the next year, and the center became a regional magnet." 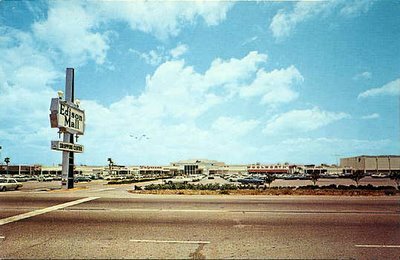 A rather lo-fi shot here, but I really like being able to see Edison Mall's cool and stylish entrance sign in this vintage postcard--alas, they don't make 'em like this anymore. Wish I had a nighttime photo so we could see what it looked like lit up and glowing in the night sky. Bet it was purty. The mall's Woolworth's store is visible in the center, and a Penneys anchor is just to the right of it. There was a Sears here originally too, as well as a Maas Brothers store. 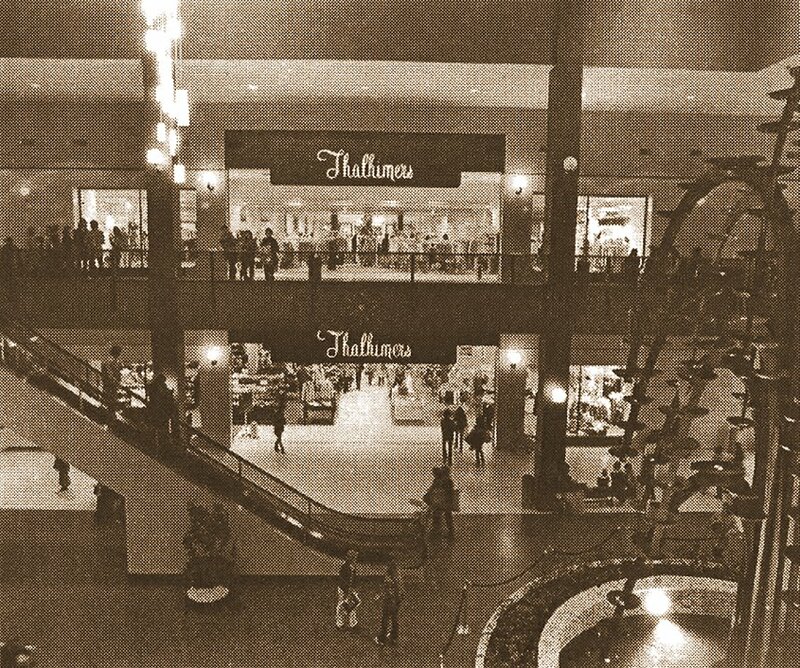 Another wing was added in the 1980s that included Burdines (now Macy's) and Dillard's as anchor stores. 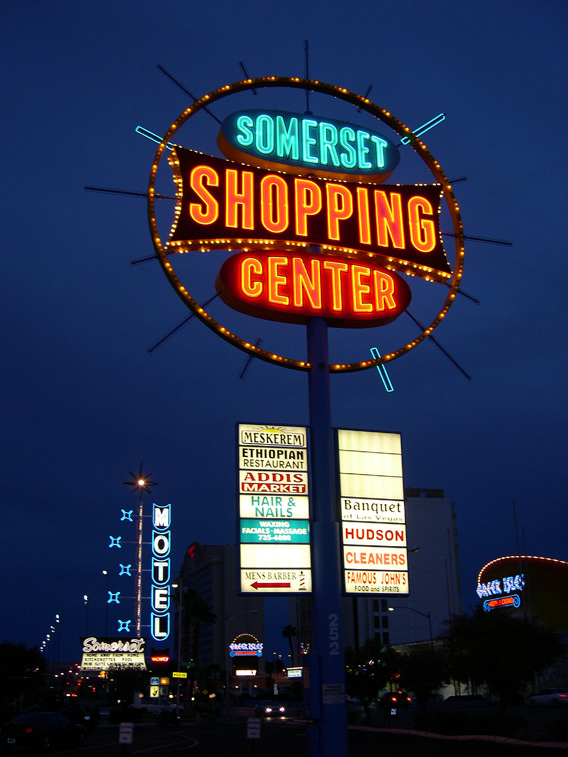 Groovy nighttime photo of the old Somerset Shopping Center neon sign (that's still there) in Vegas. The Landmark Drugs store in this very shopping center is supposedly where Elvis used to have his prescriptions filled when performing in town. Viva Las vegas, mama! This image is not itself vintage (it was taken last year), but obviously the sign is, so I thought it was still worth sharing in the Galleria. 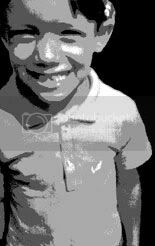 The pic comes courtesy of the fabulous Roadsidepictures' photos flickrset. (Excerpt) It didn't look like much from the outside, but then it used to be a Dillard's. What was an anchor of the Winter Park Mall, 10 minutes north of downtown Orlando, is now a place to live, work or both. The Lofts of Winter Park Village is a strange combo of things: an artsy loft-like experience in a non-urban setting. A residential building that has its own curator and interesting art displayed everywhere inside, it is actually part of an open-air mall with commercial space on its ground floor. You can live right above the Cheesecake Factory. It was the usual story with the Winter Park Mall; it got old. It was too small. Other malls opened that were glitzier. So it died. 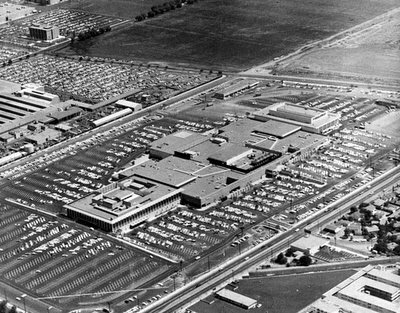 The mall was knocked down except Dillard's and in its place the new type of "lifestyle" mall was built. 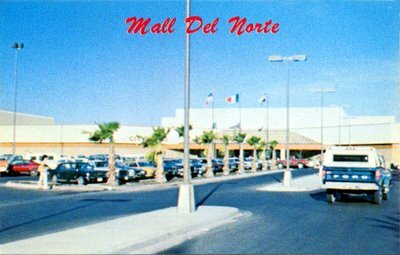 The parking lot and exterior of Mall del Norte on display in this pretty postcard, somewhere around the late '70s--not long after it first opened. Don't really know a whole lot about this shopping center center yet and there doesn't appear to much good info about it online either, so more details and history will have to wait for another time--assuming there's even enough of a story to tell eventually, seeing as how the mall only opened in 1977. Note: the bird's eye view option at the aerial link below is quite nice and well worth checking out on this one. "Sparks Street is a street in downtown Ottawa, Canada that was converted into an outdoor pedestrian street in 1966, making it the earliest such street or mall in Canada. Sparks runs from Elgin Street in the east to Bronson Avenue. The Sparks Street Mall that contains a number of outdoor restaurants and also a number of works of art and fountains only runs from Elgin to Bank Street. The pedestrian only portion continues for another two blocks westward with the final two blocks west of Lyon Street being a regular road. The mall and most of its buildings are owned and operated by the National Capital Commission." (Excerpt) General Growth Properties has plenty to celebrate this year, the 50th anniversary of the opening of its first center. General Growth is North America’s second-largest shopping center owner and also one of the biggest third-party-management firms. Not bad for a company that stumbled into the shopping center development business almost by accident. Seeking to turn the family grocery business into a chain, brothers Matthew and Martin Bucksbaum wanted to build a supermarket at a planned center in Cedar Rapids, Iowa. That was in 1954, but General Growth has repeatedly shown similar strategic flexibility since then, embracing critical changes that have helped propel it to the apex of the industry. 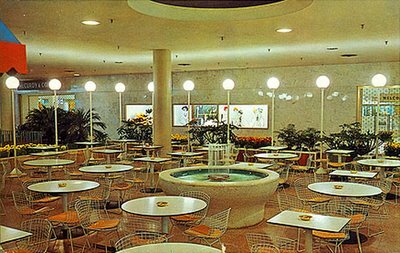 The swanky sidewalk cafe inside Midtown Plaza mall around 1964, complete with its own mini fountain in the center. You can catch a couple of very quick glimpses of the cafe at around the 4 minute mark of the Midtown Plaza video I posted a while back. Albuquerque, New Mexico - circa 1960s? 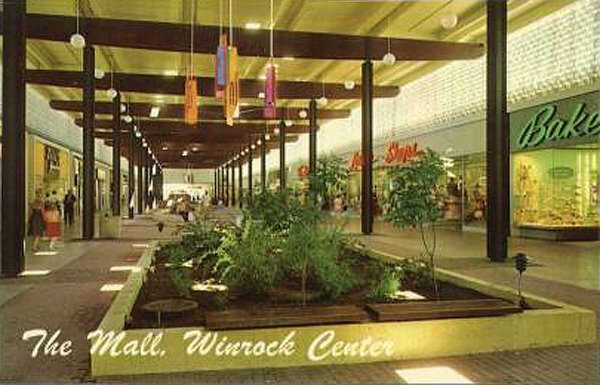 Winrock Shopping Center sure looked like a swanky place back in the day, didn't it? 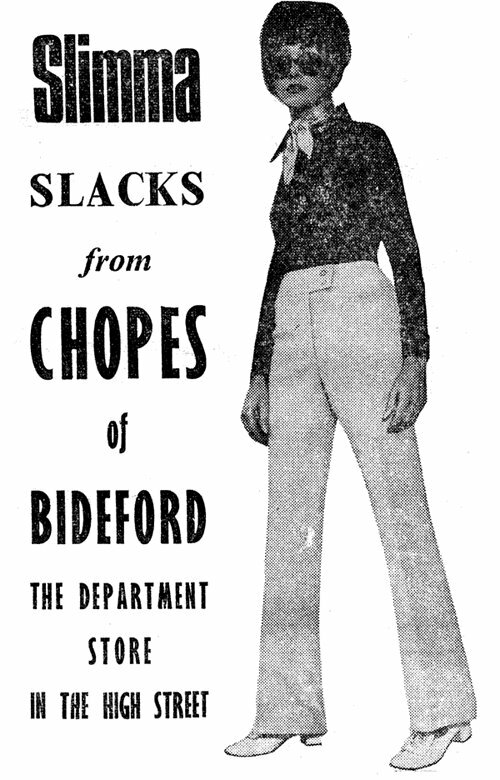 Found this very groovy 1971 British ad for "Slimma Slacks", over at the Chopes of Bideford department store website. 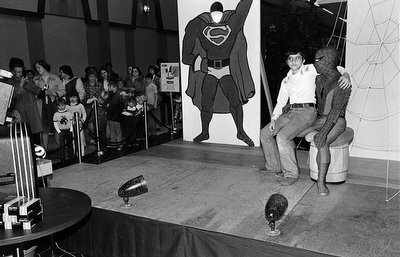 If you don't see the utter coolness in this photo, then man, you just aint with it! 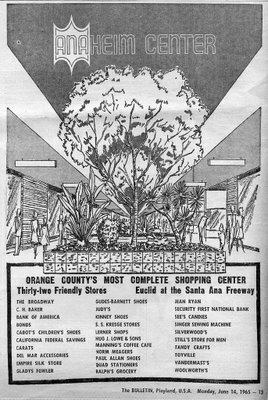 "Opened February 10, 1964, Topanga Plaza was California's first enclosed shopping mall. It was originally anchored by The Broadway, May Company and Montgomery Ward. Nordstrom was added in 1983. In 1992 May Centers, Inc., the original developer, was renamed CenterMark Properties and sold by May Department Stores in 1993 to a consortium led by Westfield Holdings, Ltd., a predecessor of The Westfield Group. 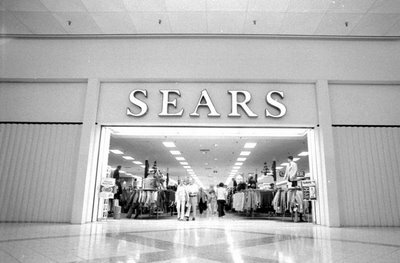 The May Company location was renamed Robinsons-May in 1993, The Broadway location was sold to Sears in 1996 and the Montgomery Ward closed in 1999. As previously mentioned, Robinsons-May was renamed Macy's in September 2006, and despite rumors to the contrary will continue to operate the store despite the proximity of the Macy's at Westfield Promenade." Nice artsy looking angled shot of the main entrance to the Sears store at the Desoto Square Mall in 1977. (Excerpt) Forget Sears, Roebuck. Nowadays Sears, Tiegs might be more appropriate. In 12 million American homes, the first image Sears customers are seeing as they flip through the new fall-winter catalog is the cover picture of Model Cheryl Tiegs, wearing a cardigan sweater and an autumn plaid skirt, her smiling face and long blond tresses beckoning potential buyers into the magic world of America's largest retailer. Sears has taken a fancy to Tiegs, embracing her in its catalog and TV commercials and identifying itself with her wholesome all-American looks. The chemistry has been sizzling. 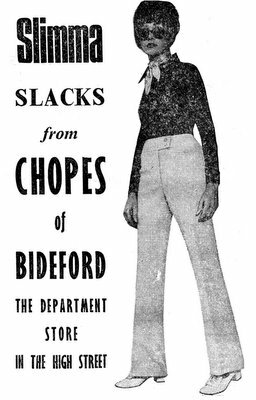 Just two years short of its 100th birthday, the once staid and conservative Sears is showing the friskiness of a teen-ager who has won a date with Tiegs. 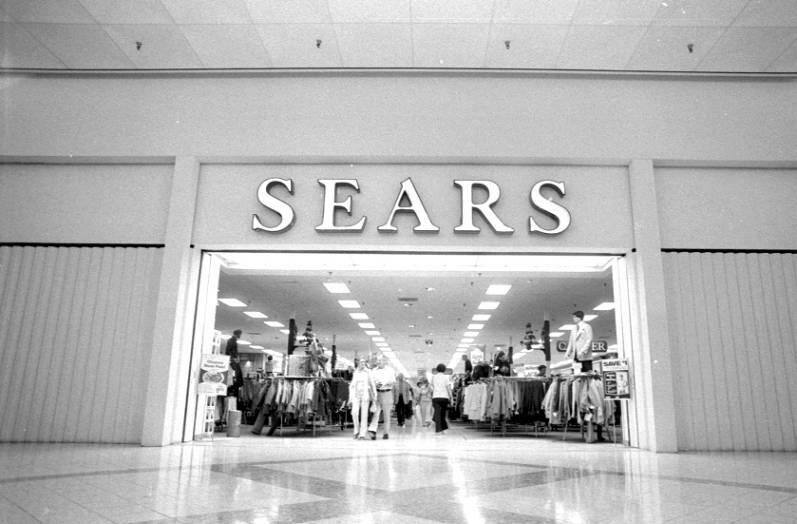 In fact, some people would say that Sears has become downright sassy. That new image is a result of the vitality that is reinvigorating one of America's most famous companies after a period of drift and uncertainty. Last month Sears changed its logo to something resembling slanted racing stripes, only the second redesign in its history and the first in 21 years. 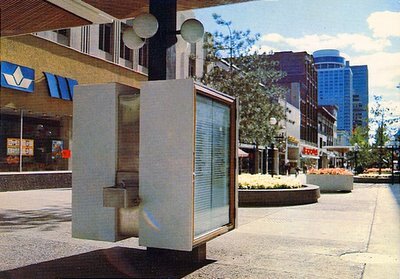 Even though this looks like someone's personal polaroid snapshot photo, it's actually from a 1970s-era Midtown Plaza promotional postcard. 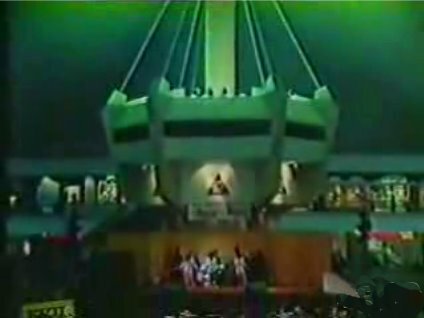 In fact it was so dark and dreary looking, I went in and lightened it up a little bit digitally, so more interior mall detail was visible--including the famous "Clock of the Nations", that you see again here. Obviously Midtown Plaza's most popular (and most-photographed) feature. "In this episode of The Collaborators, a robbery has taken place at a bank (CIBC) and a hostage situation has taken place. The robbers take the hostages thru the mall. They walk by St. Clair Paint, Eaton's, Golden Dolphin and Radio Shack." The YouTube member here is unsure of which shopping mall these scenes were actually filmed in, however, but guesses it might be the Scarborough Town Centre, which opened in 1973 in Toronto, Ontario, Canada. For my part, I have no idea. But I like grooving on old mall footage wherever it's filmed at, so it's still cool to me either way. And yes, William Shatner is the robber. "Woodfield's dramatic focal point was the carpeted amphitheater area with its fantastic surroundings of the fountain, waterfall, pools, balconies and ramps above, the suspended moiré piece of art, the stunning ceiling, and more. The large Kenneth Snelson sculpture was actually separated from the main open space of the grand court by two ramps. This separation created kind of a quiet zone for the sculpture's setting and the seating area at its base." 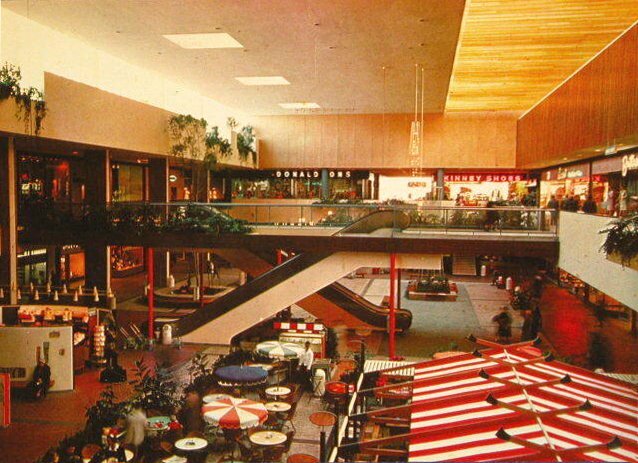 "Crabtree Valley Mall opened in 1972 at the intersection of US 70/NC 50 (Glenwood Avenue) and the I-440 Beltline. Original anchors were Hudson Belk, Sears, Miller & Rhoads and Thalhimer's. The mall also included G.C. Murphy and Piccadilly Cafeteria. From the start, the mall pulled shoppers from all over central and eastern North Carolina. Many of them came to the 251,000 square foot Hudson Belk, which is still the largest store in the complex and serves as a Belk flagship. 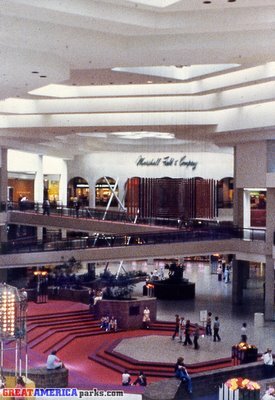 The mall was remodeled in the mid 1980s and added many upscale specialty stores. If faced remarkably little competition in its market until the 1990s, when Cary Towne Center in nearby Cary doubled in size and spawned a companion mall, Crossroads Shopping Center." (Excerpt) On the inside, Crabtree Valley Mall hides its age well with marble floors, bright banners and new trendy stores such as Pottery Barn and Restoration Hardware. On the outside, the 30-year-old shopping center is running out of room to keep up with the demand. Mall developers have not formalized future growth plans, but they never stop thinking about it, says Neil Rudolph, vice president of Crabtree's management company, Plaza Associates. The two-story mall is landlocked between Crabtree Creek, Glenwood Avenue and Edwards Mill Road, and if the mall outgrows its 1.3 million square feet of retail space, it will have to go vertical. 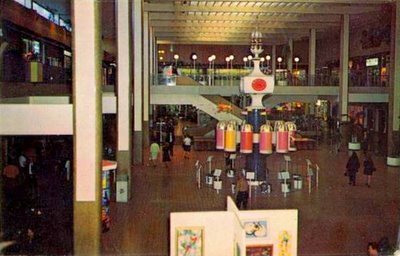 The 1978 TV teen movie, Cotton Candy, directed by Ron Howard (starring his brother Clint, and Charles Martin Smith), contained extended scenes that were filmed inside the Town East Mall in Mesquite, Texas, which is still there today. 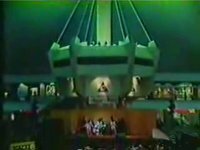 And luckily for us vintage mall lovers, that footage has turned up online (courtesy of YouTuber rauch77). I'll try and cover this mall in more depth soon. Anyway, the movie itself centers around a group of high school friends who form a rock band (they stink) and enter a Battle of the Bands contest (at Town East Mall!) against the local bad boy rock band (who also stink but have better hair and outfits). "An urban renewal sign in the village of East Rochster. 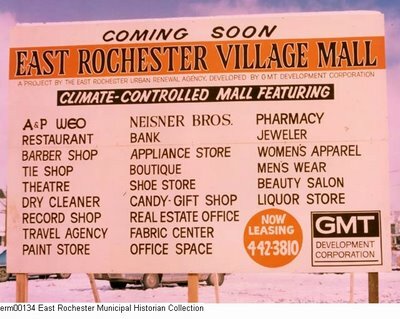 The sign announces the coming of the East Rochester Village Mall and lists several types of businesses that would be tenants in the new building on Main Street. The mall opened in the summer of 1974. Its name became the Techniplex Mall in 1983." 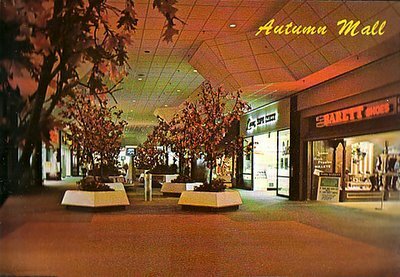 Welcome to the East Rochester Village Mall, as we step back in time to 1981 for this atmospheric interior view. 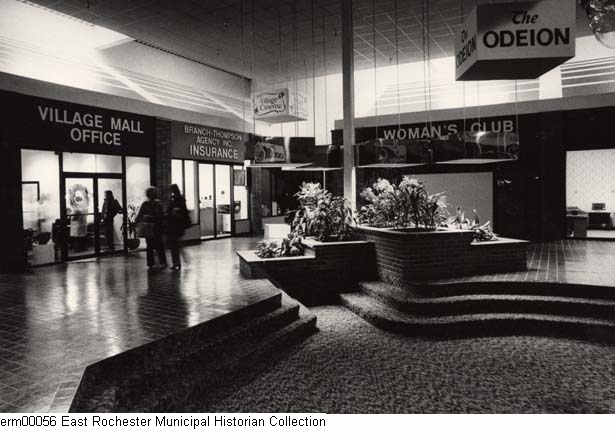 An initial cursory search didn't yield much about this forgotten shopping mall in the Village of East Rochester, New York, so I don't know a lot about it yet. 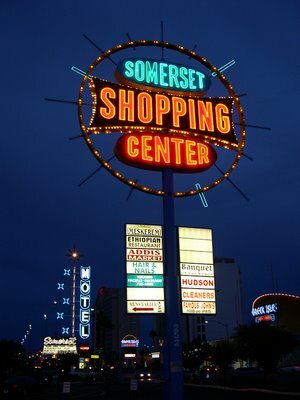 I'm not even sure whether or not it's still standing there in its original "mall" role today. The Google aerial below points to it (as Techniplex Mall), but it looks pretty dilapidated and deserted--small, too. What I do know is that the mall opened on Main Street in the summer of 1974, as part of an urban renewal project, and that it was renamed, Techniplex Mall, in 1983. I also read that it was widely rumored to have been built by mafia construction companies in 1973. No word on any possible Jimmy Hoffa burial theories, though. 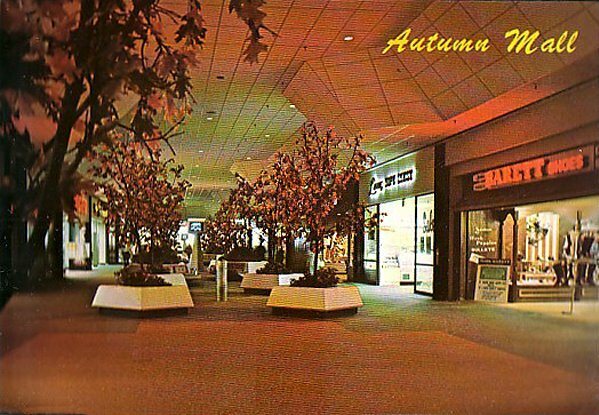 Mall history: 1974 - ? "A view of shopping at malls in Appleton, Wisconsin turns into a meditation on cultural values and change." (Excerpt) Where shoppers in Warner Robins used to buy Kenmore washers and Craftsman tools, patients needing to check their blood count and their oxygen level now go in for evaluations and treatment. Where browsers once thumbed through the latest best-selling novels, drivers caught violating the click-it-or-ticket seatbelt law wait to see if the judge will throw the book at them. Where moms would bring the kids to try on back-to-school clothes, the Air Force Reserve Band practices for its next performance. Where thousands of folks got their prescriptions filled, clerks now process your hospital bills. This is the new old Houston Mall. 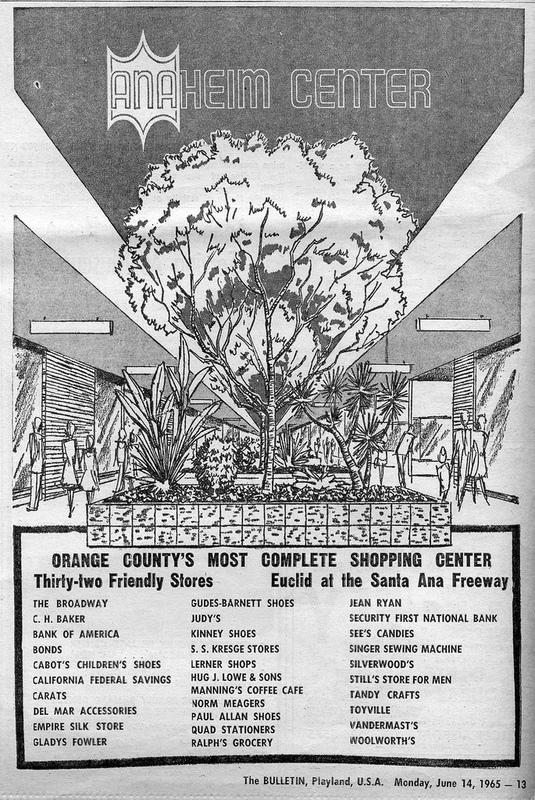 Even though this vintage ad says Anaheim Center, I'm assuming (judging by the store lineup and location anyway) that it's still the Anaheim Plaza (as we knew it in more recent years), just going by a slightly different name. Or was it originally called Anaheim Center? Not sure. Oh, and I also couldn't resist sharing a nice little graphic (left) from their website, just because it looked so dang cool. Actually, it kind of puts me in mind of the '70s style of retail advertising illustration...and I always appreciate that kind of trip. My hat's off to the artist behind it! Polo Park has just launched a major $30 million renovation project (uh, they're calling it "makeover madness", which they proclaim is "taking over Polo Park! "), the ongoing updates of which can be found here, as well as here, for an overview on the pending changes to the shopping center...er, centre. 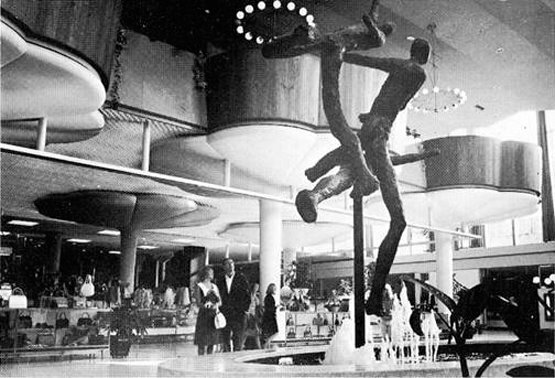 Photo of a couple studying one of the fountain sculptures in the ever-so-groovy Yorkdale Shopping Centre. Yorkdale may not be in the U.S., but it's still one of my vintage favorites, as far as cool malls of old, go! 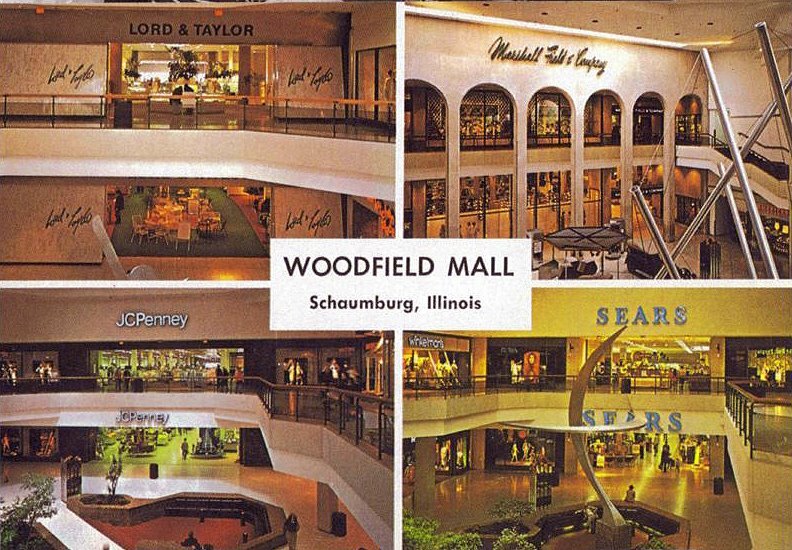 This image was found in an old Encyclopedia Britannica from the 1970s, and I thank Malls of America reader and frequent contributor, J, for both the find, and (more importantly) swanky submission! (Excerpt) Most Americans no longer gaze in wonder at the landscaped center court of a super-regional mall. For many, power centers have become just another part of the daily or weekly shopping routine. 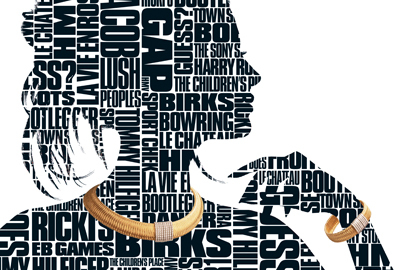 The affluent have long come to expect trendy shops and good restaurants in now-familiar lifestyle centers. Bus rides get shorter for bargain hunters as factory outlet malls proliferate. Food courts, once remarkable for bringing together such a range of choices, are now just a place to refuel. Even the mammoth shopping and entertainment centers, West Edmonton Mall and Mall of America, have been around for a number of years. But nearly every element of today’s diverse retail landscape once represented the radical notion of some visionary. Shoppers take a shopping break (and grab a bite) at the Oriental Festival restaurant, in Northway Mall (now Shoppes at Northway). Reminds me of the old cafeterias, grilles, and such, that I grew up with at my local malls and department stores. 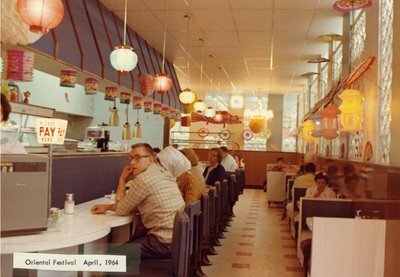 Woolworth's Harvest House and those aqua-colored Kmart cafeterias come especially to mind for me. OK, so let's begin to dive back in... This is a cool vintage TV commercial I came across on the 'Tube. It's from 1978(! 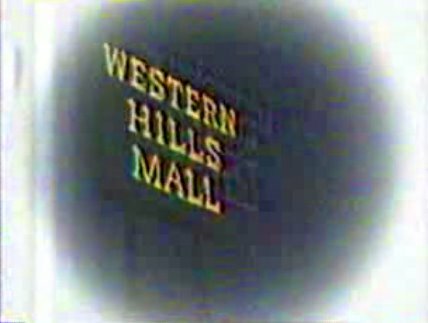 ), and it's an ad for Western Hills Mall in Fairfield, Alabama. 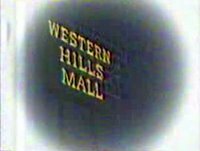 It's short but sweet, and also gives me the chance once again, to reiterate how much I just love these kinds of old local TV shopping mall and retail commercials! Something about them really gives me the warm & fuzzy's. "Western Hills Mall is a shopping mall located in Fairfield, Alabama (with part of the property within the city limits of Midfield, Alabama). It opened in the late 1960s with two anchor department stores, Loveman's and J.C. Penney, a Woolworth's discount store, a Britling cafeteria and about three dozen specialty stores. It was the second mall to be built in the greater Birmingham, Alabama area. In 2006, Western Hills Mall underwent a major transformation. 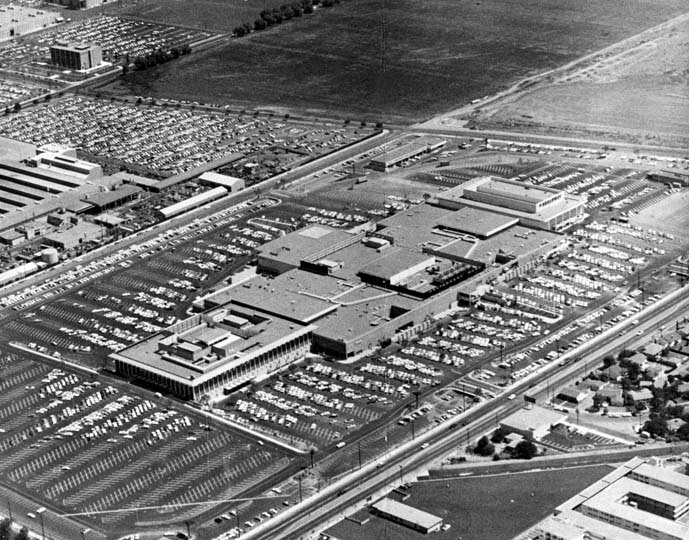 The Penney location was completely demolished, with the mall building being truncated at the former Penney entrance. In its place, a new Wal-Mart Supercenter was built. The Supercenter replaces an existing standard Wal-Mart (itself a former Woolco location) across the street. The mall is unique in that it has successfully implemeted a redevelopment plan that now includes a new anchor, Burlington Coat Factory, and is a cornerstone to the redevelopment of the Fairfield-Midfield retail district."